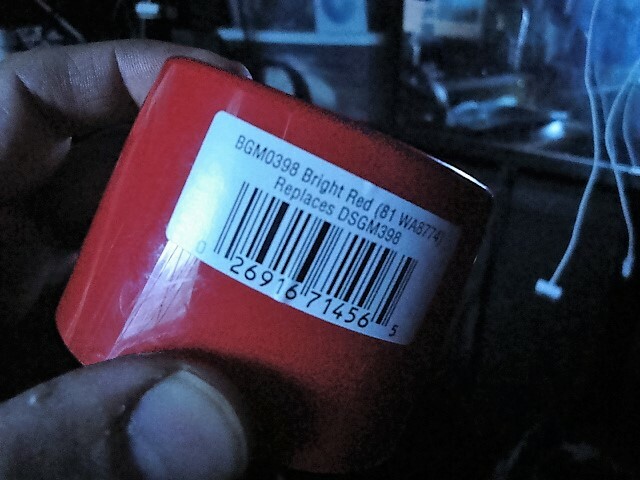 So for those who also find the need to paint parts on their bike but don't have the resources (usually time) to go to an auto paint shop, I found a paint at pep boys that is super close to stock red. It is what I painted my belly pan with and its too close to even tell its not stock paint. Dupli-Color Perfect Match BGM0398 Bright Red (81 WA8774) Replaces DSGM398. Soon after the start of this thread, I picked up a can of said paint. While the color is an OK red, it is not a suitable match for Italian Red (R-57). Too much yellow. The orangery red is quite noticeable. Having given it a test ride, I don't recommend it. Last edited by xeris; 03-22-2018 at 07:27 AM. Soon after the start of this thread, I picked up a can of said paint. While the color is an OK red, it is not, a suitable match for Italian Red (R-57). Too much yellow. The orangery red is quite noticeable. Having given it a test ride, I don't recommend it. The Factory Italian red is a tough beast to match, even "proper" color from a Auto paint guy done on computerized mixing station does not match either of my Red bikes.....it had to be hand mixed to get it right. Always found ColorRite to be an exact match with reasonable prices and fast shipping. Give them a try!